Creamy Tuscan Shrimp are coated in a thick, rich, and creamy Parmesan sauce with spinach, garlic, and sun-dried tomatoes. Serve over pasta or with toasted French baguette as an appetizer. These shrimp are incredibly delicious! 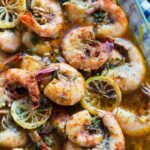 Since I moved to Charelston last month, I promised you lots of shrimp recipes. The fresh local shrimp here are to die for! So far I’ve made Spicy Shrimp Dip , Cajun Shrimp and Corn Chowder, and New Orleans-Style BBQ Shrimp. 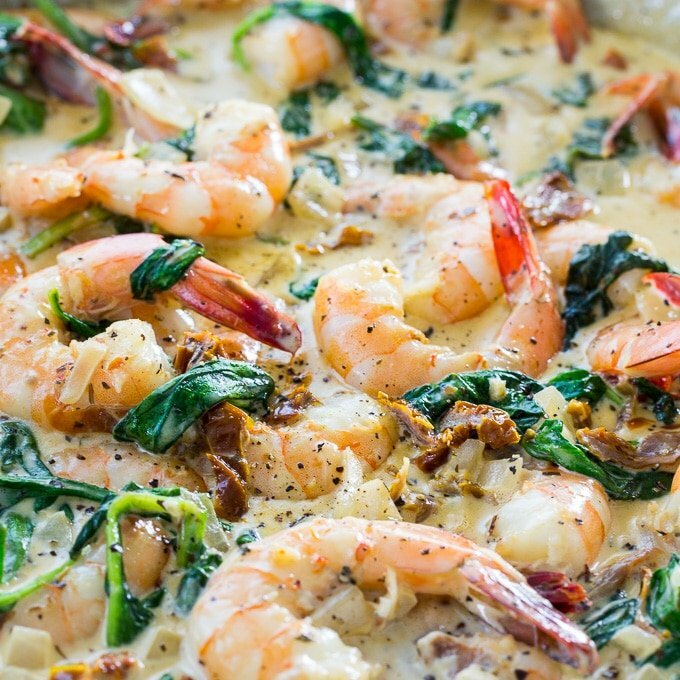 If this Creamy Tuscan Shrimp appeals to you, check out this Crock Pot Tuscan Chicken. It’s fabulous! Creamy Tuscan Shrimp is the perfect dish to impress your guests and once you get the shrimp peeled, it’s really quick and easy to put together. This dish can be made in under 20 minutes start to finish. Got to love that! For extra flavor, the oil from the jar of sun-dried tomatoes is used to cook the shrimp. I learned that trick from this recipe for Chicken with Sun-Dried Tomato Cream Sauce. There’s 1/3 cup of white wine in this recipe but you could sub vegetable broth or even chicken broth. Shimp by themselves taste divine, but even better when swimming in garlic and Parmesan cream sauce! 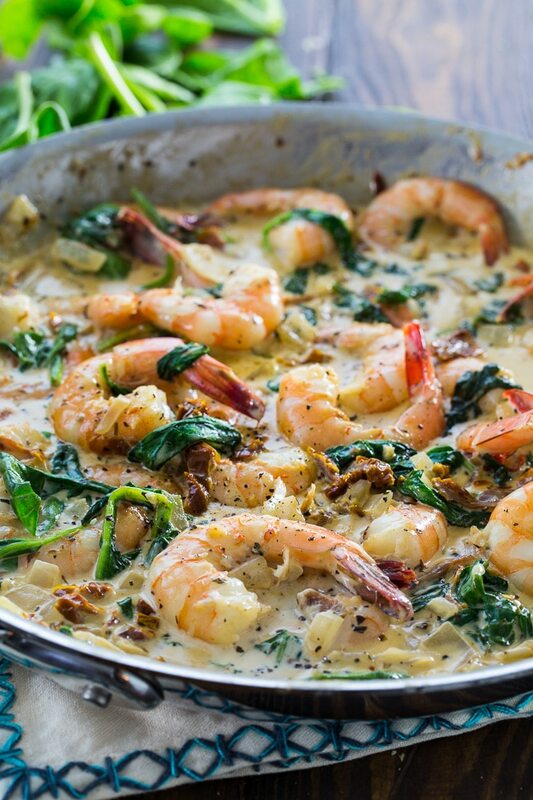 You will love these Creamy Tuscan Shrimp! Heat butter and oil in a large skillet over medium-high heat. Season shrimp with salt and pepper and add to pan along with garlic. Cook 2 to 3 minutes or until shrimp is cooked. 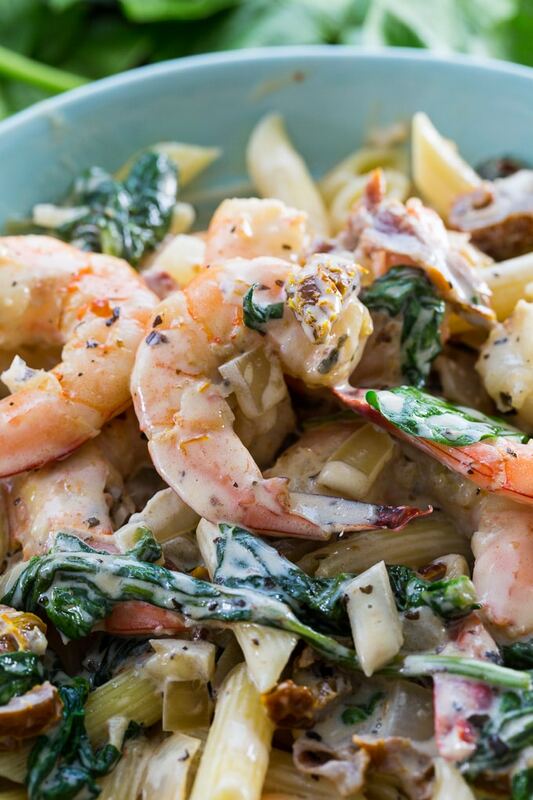 Remove shrimp and garlic with a slotted spoon to a plate and set aside. If necessary, add a touch more oil to the pan. Cook onion until soft, about 3 to 4 minutes. Add basil and red pepper flakes. Add sun-dried tomatoes and heavy cream. Simmer for 2 to 3 minutes. Turn heat to low and stir in Parmesan cheese until melted. 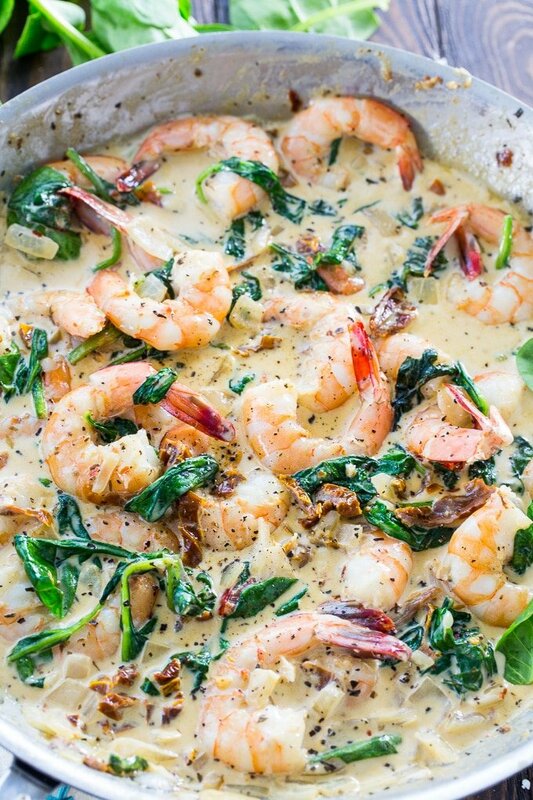 Add spinach and return shrimp and garlic to skillet. Stir to wilt the spinach. Serve with pasta if desired. This entry was posted in Appetizers, Dinner and tagged seafood, shrimp. Bookmark the permalink. Made this last nt and it was fabulous! I added pasta to the sauce instead of making an appetizer. Great flavors and so easy! Will definitely make again! Loved it! So creamy and the flavors really do well with the shrimp! Or can any steps be made ahead? Yes, you can make it ahead and reheat. If it has thickened too much, you can add a little more cream or milk to thin the sauce. Also be careful not to reheat for too long or the shrimp will overcook. I have no idea what David is talking about. This recipe is amazing, we’ve enjoyed it several times! Not a good combination. A waste of good shrimp. Taste like something from a fast food restaurant.